Tag line: "IT WILL LIVE IN YOUR MEMORY forever! " For me, the definitive version of The Phantom of the Opera has always been Lon Chaney’s 1925 silent masterpiece, which has since become legendary thanks to its star’s tremendous performance, as well as the incredible make-up he designed for the title character. 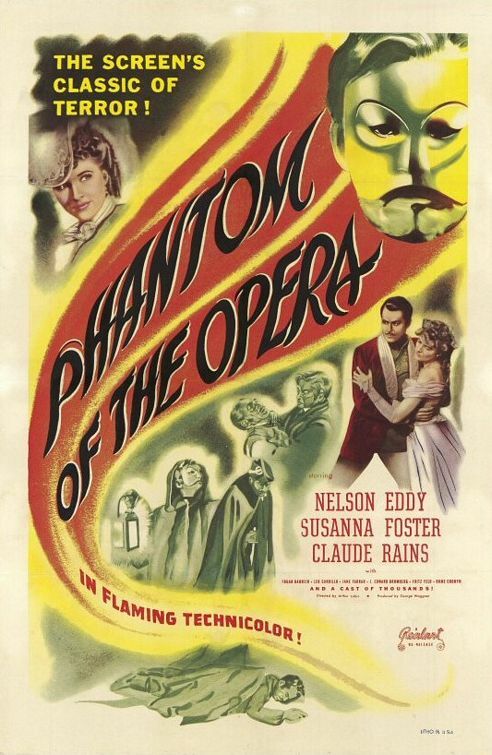 Unfortunately, 1943’s Phantom of the Opera, which was directed by Arthur Lubin, does nothing to change my opinion. It’s a gorgeous motion picture, but this particular version strips away many of the story’s darker elements, resulting in a horror movie with very few thrills. Enrique Claudine (Claude Rains), a violinist for the Paris Opera, is infatuated with Christine (Susanna Foster), one of the Opera’s most promising young singers. In fact, he’s so enamored with her that he’s set himself up as her benefactor, paying a handsome sum for her music lessons (which he does anonymously). When his failing hand costs him his job with the Opera, Claudine attempts to sell a concerto he’s written, which he hopes will bring in enough money to continue Christine’s lessons. But a misunderstanding turns deadly when Claudine, convinced his concerto has been stolen, murders the man he believes responsible, and , during the melee, Claudine has acid thrown in his face, leaving him horribly disfigured. Now a man on the run, he takes up residence in the catacombs underneath the Opera House, donning a mask to hide his deformity. Through it all, Claudine continues to take an interest in Christine’s career, and even though she’s being courted by two other men: Policeman Raoul Dauber (Edgar Barrier) and fellow singer Anatole Garran (Nelson Eddy), Claudine, now known as the Phantom, will do everything he can to make Christine his own. The main issue I had with this Phantom of the Opera stems from its inclusion of a back story, during which we “get to know” Claudine prior to his becoming the Phantom. Though well-told, this back story, which takes up the film’s first 30 minutes, weakens the character’s effectiveness once he puts on the mask. In the 1925 version, the Phantom was infatuated with Christine (played in that film by Mary Philby), yet there was an underlying insanity in Chaney’s portrayal, a hint of madness that made his Phantom a man to be feared. Rains, who was perfect as the maniacal title character in 1933’s The Invisible Man, brings none of the same intensity to this part, and as a result, even when he becomes the Phantom, we see him more as a victim of unrequited love than a monster. 1943’s Phantom of the Opera is very pretty, with colors so vibrant they pop off the screen. The cast is tremendous, the opera sequences well-staged, and the sets exquisite. So much about this rendition of Phantom of the Opera is perfect, which, unfortunately, lessens its impact as a horror movie. In most versions of the story, there’s at least a hint of darkness, but with this film, much of the menace is pushed to the background in favor of artistry. This Phantom of the Opera is, indeed, beautiful, but it’s also quite bland.